Barring three years with Dundee, and a youth apprenticeship spent at Sunderland, the 35-year-old defender has spent most of his career with his home-town club. His length of service, approaching 450 games, has earned him a place among the legends in the club’s Hall of Fame, and makes a testimonial overdue. However, being the local lad comes with added pressure and he has had an up and down, love-hate relationship with the support over the years. Had Rovers lost again to East Fife on Saturday, ‘Davo’ would have bore the brunt of it, but his terrific late equaliser, which led to Kevn Nisbet’s even later winner, ensured he was the toast of Kirkcaldy on Saturday night. “It’ll be nice to enjoy it for a couple of days!” he smiled. “Everyone at local clubs has it good and bad, and I’ve got that with the Raith fans. “I’ve scored an important goal, and while it would have been nice to keep a clean sheet, it’s a derby win and that’s the most important thing. The frustration in the away end was building towards the end of Saturday’s match, but two goals in the space of two minutes completely transformed the mood, turning what would have been an angry reaction into a scene of wild celebration. “Football is very fickle, and things can change very quickly,” Davidson said. “If we hadn’t got that result we’d have probably had to take a bit of stick from our fans at the end of the game, but thankfully that wasn’t the case and they’ve gone away home happy. “The equaliser was massive but as soon as I scored it, I was just saying to the boys to get the ball, let’s kick on and get the winner, and that’s what we did. “The changing room is buzzing but it was an unhappy place at half-time with a few choice words said between everybody. 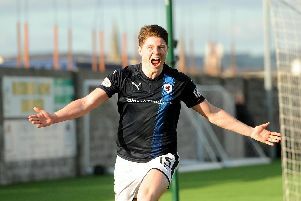 Davidson is hoping that Saturday’s happy ending can be a catalyst that spurs Rovers on to promotion via the play-offs. “It will help instill a wee bit more belief that we’ve shown that endeavour and attitude to keep going,” he said. “We need momentum going into play-offs, there’s no getting away from that. “Grant Gillespie has spoke about it when he was at Hamilton and nobody expected them to do it and get to the Premiership.